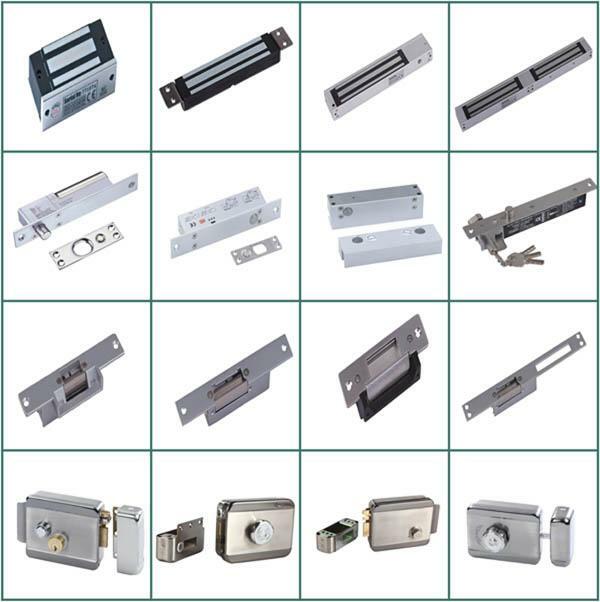 An electromagnetic lock, magnetic lock, or maglock is a locking device that consists of an electromagnet and an armature plate used for access control door locks. By attaching this to the door frame and the armature plate to the door, a current passing through the electromagnet attracts the armature plate, holding the access control door lock shut. 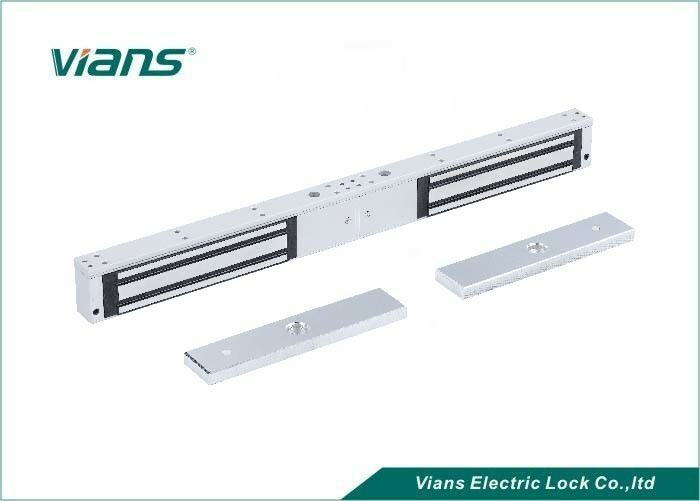 Unlike an electric strike access control door lock a magnetic lock has no interconnecting parts and is therefore not suitable for high security applications because it is possible to bypass the lock by disrupting the power supply. 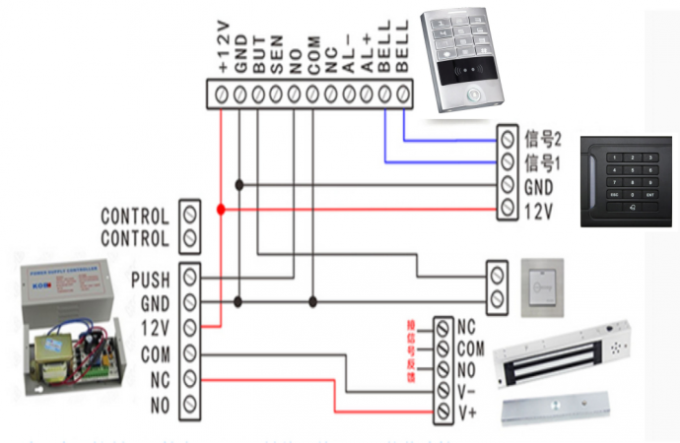 The whole system includes electric lock,power suply,access controller,exit button,door bell or RFID cards. 1. Collinear Load Test 180kg,350pounds. 1. Circuitry malfunction or low voltage. 2. The power supply wire is too thin and long to cause big decrease of voltage. 3. Power supply is broken to cause no voltage output. 4. The positive and negative wire of power supply is connected in reverse. 5. The electromagnetic lock no power input. 1. Check the connection, and measure the voltage to see if it is normal. 2. Modify or change the power supply wire into thicker one. 3. Check the power polarity and correct the connection. 4. Check to see if power supply or controller is correctly connected to NC.Make sure to see up the controller correctly. No transform of indicator output with low holding force. 1. The mount plate and the electromagnetic lock face not in complete close. 2. The mount plate is fixed to tight, no room to move. 3. The electromagnetic lock and the mounting plate not at same level for case the door is deformed or moved. 4. 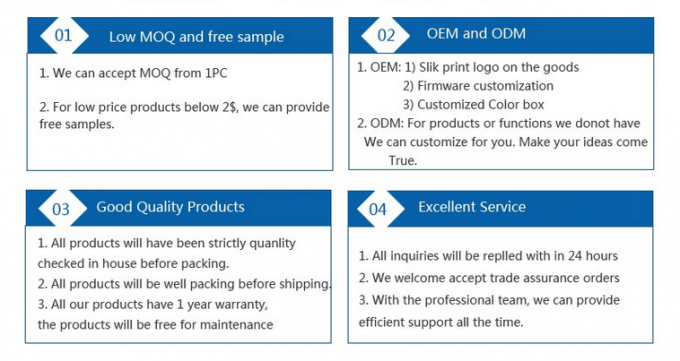 The surface of mount plate or electromagnetic lock is not clear. 5. The power supply with lower power. 6. The power supply wire is too thin and long. 7. The electromagnetic lock is malfunction. 1. 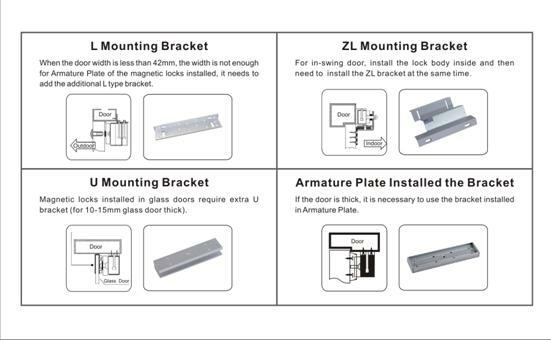 Check the face of mount plate or electromagnetic lock, if the face of plate is deformed to cause no complete close to the lock, please change the plate. 2. Check if the rubber gasket is put into the stick of plate, and adjusts the bolt of plates not too tight at least a little movable. 3. Adjust the mount plate and electromagnetic lock to be level at each other and close completely. 4. Clean the surface of lock and plate, if rusted to cause no working please change the part. 5. Use millimeter to check the voltage and current of electromagnetic lock to see if it is normal, or need repairing or changing power supply. 6. Change into high quality power supply wire, better no more the 20 meters. 7. Repair or change the electromagnetic lock. Door cannot open The power is not cut off To check out the connection of power supply and controller, the electromagnetic lock is power-on locking power-off opening type. The lock can be open once power off.